Clean, quiet and friendly, Zebra Crossing is situated at the foot of Table Mountain close to cafe's, cinemas, supermarkets and museums. Centrally located just up from trendy Kloof street, 5 minutes walk from vibrant Long street , 5 minutes by taxi from the Waterfront and Table Mountain Cableway and within easy reach of Cape Town's famous beaches. 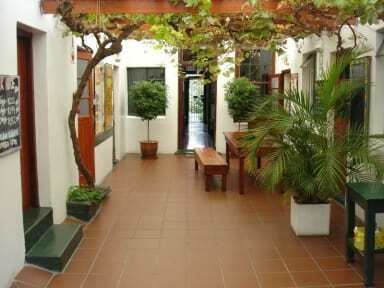 Family friendly, we are generally considered to be one of the quieter hostels in Cape Town. Facilities include leafy garden and courtyards with barbeque, fully equipped kitchen, Cafe' with internet access and the Blue Skies Travel Center for all travel arrangements. Some of the rooms have good views of Table Mountain. We also provide comprehensive information, arrange airport shuttle, inexpensive car hire and tours. Basic accommodation but safe and good location. Close to town and bars etc. Staff are really helpful and informative of things to do. Also good outside areas. Great place to stay! Supermarkets, ATM, restaurants nearby. Staff is amazing, thanks so much to Katrin and Alex! You can book all kinds of different tours with them like Wine Tasting, guided tours to a Township, etc. They also have their wonderful driver Craig available with whom you can arrange transfers from/to the airport + any other destination in/around Cape Town. One of the best hostels, if not THE best, at which I've ever stayed because the staff are so fantastic. I had a fiasco involving a lost credit card that the staff worked tirelessly to assist me with, unloading some of the stress and panic that came with being without money in a foreign country. Comfortable and clean, nice location, great atmosphere for meeting other guests. Amazing staff, very helpful with arranging my things, I really appreciate their attitude. I was staying in single room, it was bit small, but enough just to oversleep. Booked one night, stayed 3 weeks! Perfect base, secure, friendly, helpful, clean and Bronwyn’s little diner is perfect! A good location, close to the fun and also to TABLE Mountain. Staff were kind but could be more helpful, although they were kind enough to let me cancel one stay without any problem. Large rooms and great value for money! Safe and clean hostel. In an awesome location. The hostel caters to a mix of people- individual travellers to families. One night I did have a screaming baby next door to my room... the hostel does not generate much atmosphere- nothing was planned for New Years/ culture celebrations. Suits those who want to lie low in Cape Town. The hostel seems to be forgotten by the owner.